As I was walking in the side garden today, suddenly a stand of Hedychium coronarium (White Ginger Lily) just beginning to bud caught my attention. In good years fragrant white flowers will perfume the garden in late summer to early fall and it looks like this might be one of those special years. This Ginger Lily, a pass-along plant from a horticulturist neighbor, has been an unreliable bloomer, but when it does bloom the effect is so memorable as to make it worth keeping it around just in case. 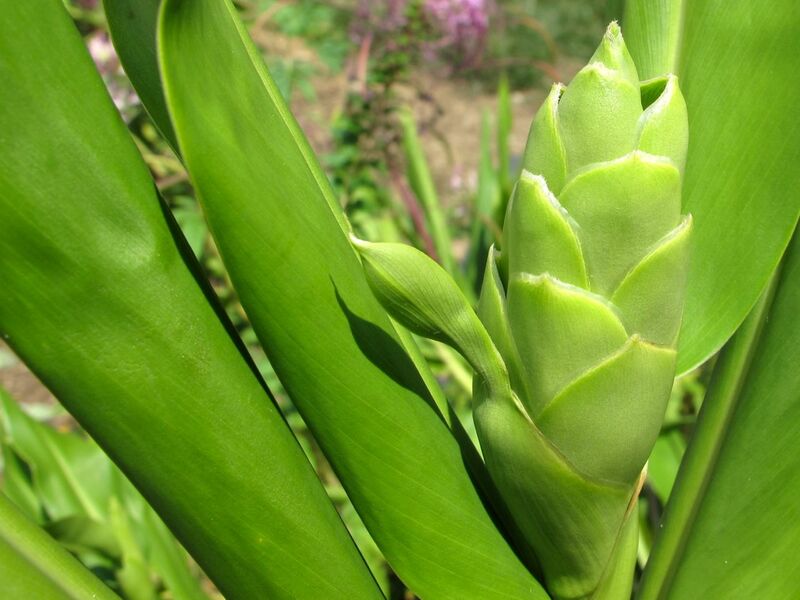 With plenty of heat and humidity this summer, conditions have been just right for ginger lily to thrive. Though there have been no showers for the past five or six days, there has been a good amount of rain overall, sending these moisture-loving plants up four to five feet in height. Sometimes called butterfly ginger because individual flowers are reminiscent of butterflies, this perennial is thought to be native to the Himalayas. It is the national flower of Cuba. It dies back to the ground during winter in this zone-7b garden. The second ginger lily surprise today was the discovery of a Hyla cinerea (Green Treefrog) hanging out mid-day, flattened against one of the nearly two feet long leaves enjoying the shade. 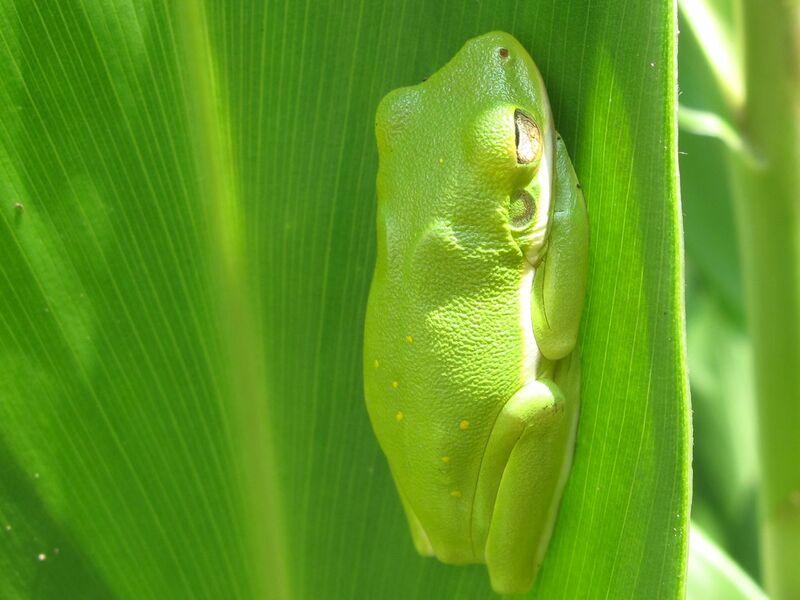 Yellowish green with an ivory stripe along its side and yellow dots on its back, this Green Treefrog will be searching for flying insects later tonight. 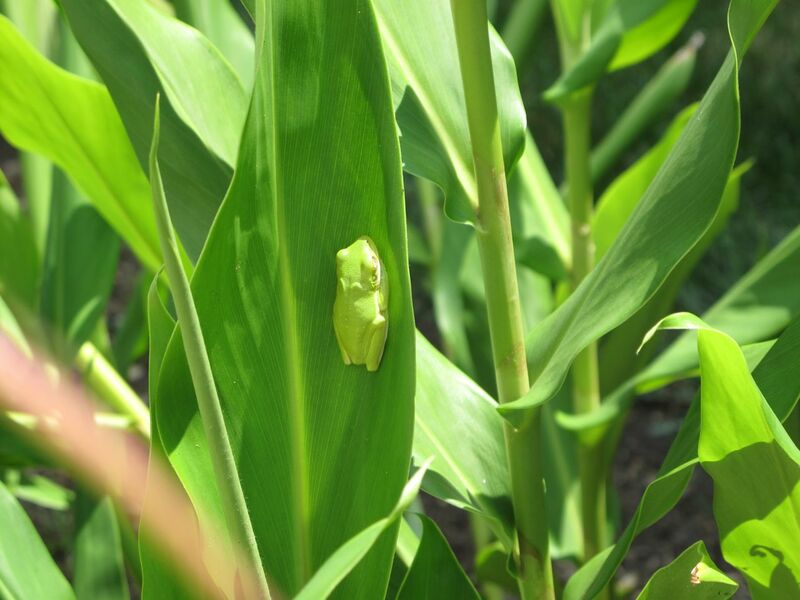 This entry was posted in garden and tagged ginger lily, Hyla cinerea (Green Treefrog), nature photography, pass-along plant, perennials, photographing nature on August 30, 2012 by pbmgarden. The foliage looks nice right now but unfortunately doesn’t contribute the rest of the year. But I am ever hopeful the flowers will come! The color of the treefrog and the emerging flower are very similar. Lovely little frog, much more handsome than ours over here! Does he realise how well he is camouflaged ! It is a well-coordinated background for a resting place.